Cryptozoic Entertainment; leading creator of board games, trading cards, and physical and digital collectibles; today announced that it will sell ten exclusive vinyl figures, several convention-exclusive trading cards; and Rick and Morty: The Pickle Rick Game for the first time anywhere. At Booth #115 at San Diego Comic-Con 2018, July 19-22 at the San Diego Convention Center. 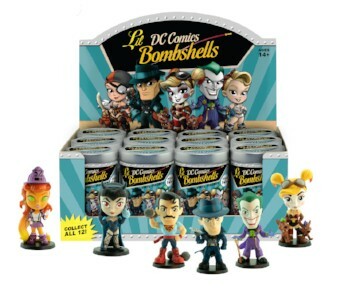 The exclusive figures include the newest releases in the Golden Goddess series; and variants of figures in Cryptozoic’s most popular lines; including DC Lil Bombshells, DC TeekeezTM, DC Pumps, and CryptkinsTM. The convention-exclusive trading cards being offered are based on Rick and Morty, Outlander, and Cryptkins. 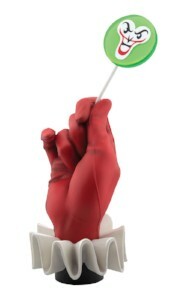 In addition, the company will release Series 3 of its popular DC Lil Bombshells figures; the Classic Harley Quinn figure, and the Harley Quinn Puddin’ Pop Statue at the show. Finally, Cryptozoic will sell the Outlander: Jamie Fraser figure, a Cryptozoic-exclusive sold at conventions and online directly from the company. said John Sepenuk, CEO of Cryptozoic. Cryptozoic’s ten San Diego Comic-Con exclusive figures were first made available via online presales. Golden Goddess DC Bombshells Series 2: These three variants of the regular DC Bombshells vinyl figures of Poison Ivy, Supergirl, and Batwoman are the follow-up to Cryptozoic’s highly popular Golden Goddess exclusives at last year’s SDCC. Golden Goddess Chun-Li (Street Fighter Knockouts): This is a variant of the Chun-Li Street Fighter Knockouts vinyl figure; part of Cryptozoic’s collectibles line featuring the powerful women from the video game series. Like the previous releases in Cryptozoic’s popular Golden Goddess series; this figure sports an eye-catching gold-and-white design inspired by classical Greek sculpture. 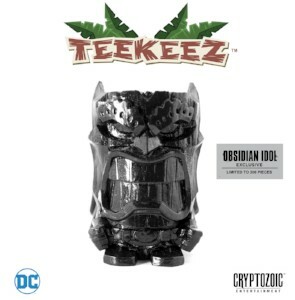 Obsidian Idol Batman (DC TeekeezTM):): This is a variant of the Batman DC TeekeezTM vinyl figure; part of Cryptozoic’s collectibles line that is inspired by tiki culture; and features iconic DC characters and a distinctive wood-carved aesthetic. 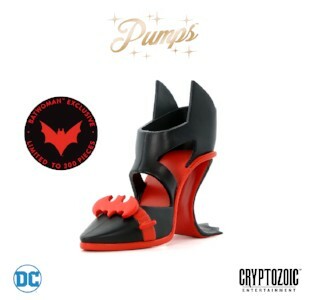 Batwoman (DC Pumps): This a variant of the Batgirl DC Pumps vinyl figure; part of Cryptozoic’s collectibles line featuring miniature high-heeled shoes; inspired by the costumes, props, and personalities of DC’s favorite female Super Heroes and Super-Villains. The figure pays homage to the black-and-red costume of Batwoman; a.k.a. Kate Kane, in current comic books from DC. 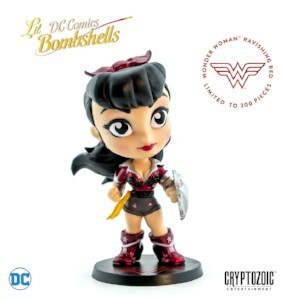 Ravishing Red Wonder Woman (DC Lil Bombshells): This is a variant of the Wonder Woman DC Lil Bombshells vinyl figure; part of Cryptozoic’s retro-style collectibles line featuring DC’s favorite female characters. This version of the figure sports metallic red paint on the character’s costume (including her headband); as a nod to Wonder Woman’s appearance in the acclaimed comic book mini-series Superman: Red Son. 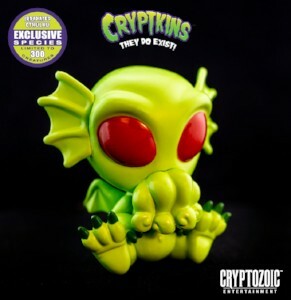 Irradiated Cthulhu (CryptkinsTM): This is a variant of the Cthulhu CryptkinsTM vinyl figure; part of Cryptozoic’s original collectibles line inspired by creatures that have been the subject of folklore and tabloid headlines for decades. 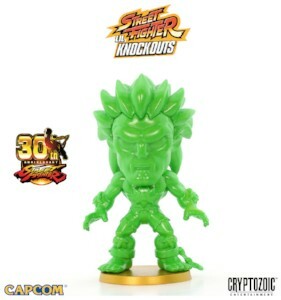 Metallic Green Blanka (Street Fighter Lil Knockouts): This is a variant of the Blanka Street Fighter Lil Knockouts vinyl figure; part of Cryptozoic’s collectibles line featuring characters from the long-running video game franchise. This version of the figure is painted entirely green; as a nod to the trademark green color of the character’s skin; as well as the flag of his home country, Brazil. 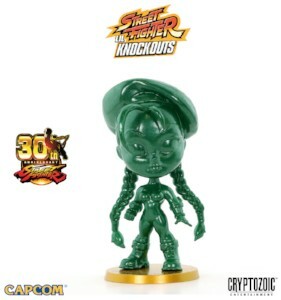 Metallic Green Cammy (Street Fighter Lil Knockouts): This is a variant of the Cammy Street Fighter Lil Knockouts vinyl figure; part of Cryptozoic’s collectibles line featuring characters from the smash-hit video game franchise. This version of the figure is painted entirely green as a tribute to the character’s signature green outfit; which indicates her military background. 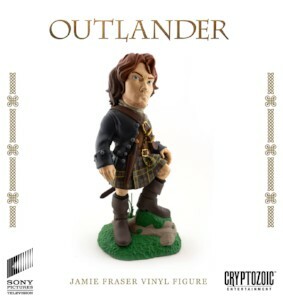 Outlander: Jamie Fraser: Based on the fan-favorite character in Starz’s Outlander TV series, the limited edition figure—only 3000 produced—is a Cryptozoic exclusive, only available at shows like SDCC and via the company’s eStore to be shipped directly to customers. Rick and Morty: The Pickle Rick Game: This intense 1-2 player game is based on the hugely popular “Pickle Rick” episode of Adult Swim’s Rick and Morty. One player plays as Pickle Rick as he tries to escape a heavily armed compound; while the other player takes on the roles of both the Russians and Jaguar as they try to stop him. The Pickle Rick player uses weapons cards to dole out damage; and Air Vents to get out of jams as he or she tries to get to the Rooftop. 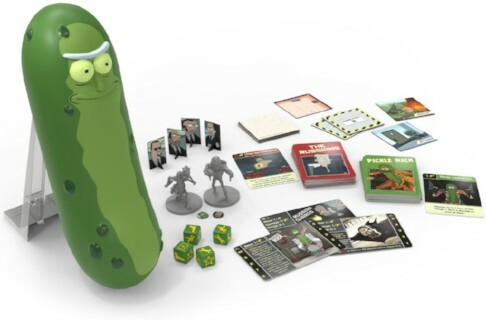 The game includes both Pickle Rick and Jaguar miniatures; that are moved across a dynamic board made up of tiles that are constantly being added, rotated, and flipped. Adding to the off-the-wall fun is the custom; collectible Pickle Rick game case that measures approximately 12.75 inches tall and holds all of the game’s components! DC Lil Bombshells Series 3: The latest release in the popular line of 2.75-inch figures has 10 unique core figures, including Raven, Powergirl, Stargirl, and a new version of Harley Quinn with her two hyenas. Series 3 introduces male figures with Batman, Superman, and The Joker. There are also two rare Noir figures based on fan-favorite characters in the Series 1 release; bringing the total number of unique figures in the set to 12. 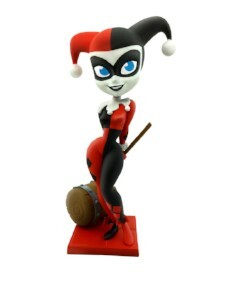 Classic Harley Quinn: This 7-inch vinyl figure pays tribute to the character’s origins by depicting Harley in her classic red-and-black jester costume, the same outfit she wore when she was first introduced in Batman: The Animated Series in 1992. 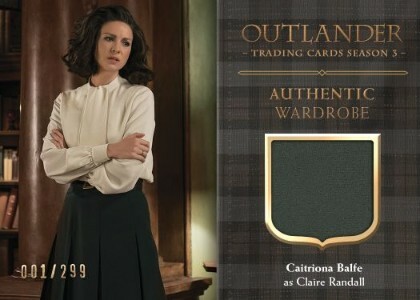 Outlander Trading Cards Season 3 — Wardrobe Card CE3: For $25, fans can get an exclusive Wardrobe Card featuring fabric used in the production of a costume worn by Claire (Caitriona Balfe) in the third season of Starz’s hit time travel drama. Only 299 cards will be available. Later this year, Cryptozoic will release Outlander Trading Cards Season 3. Which will feature a 72-card Base Set, three Chase Sets; and randomly inserted Autograph Cards and Wardrobe Cards. Rick and Morty Trading Cards Season 1 — Convention-Exclusive Pack: For only $5, Rick and Morty fans can get this five-card pack that contains an exclusive card that cannot be found in the Rick and Morty Trading Season 1 release. There will be random Autograph Cards (1:24 packs) signed by voice cast members Tom Kenny and Ryan Ridley; and Sketch Cards (1:24 packs) by some of today’s hottest artists inserted in packs. CryptkinsTM Trading Cards — Convention-Exclusive Pack: For $10, fans can get this six-card pack featuring Cryptkins. Cryptozoic’s popular original IP inspired by creatures that have been the subject of folklore and tabloid headlines for decades. After a popular launch of Crypkins vinyl figures and the Cryptkins Channel on the Quidd app; this pack bring them to the world of trading cards. Each pack includes include two Promo Cards, two “Which Cryptkin?” cards, one original hand-drawn Sketch Card, and one Download Card for an Irradiated Cthulhu digital figure on the Cryptkins Channel on Quidd.